A Variety of Lighting for Different Scenes: S1 button controls white lights(Strong-Low-SOS-Light Off), and S2 button controls Red Light- Blue Light-Light Off, different lights meet your different photography needs. Waterproof Design for Underwater Photography: IPX8 waterproof and waterproof depth is up to 60M/195ft, ideal for diving photography. 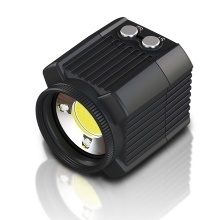 You can take wonderful pictures of sea creatures with this mini LED light. Convenient Rechargeable Design: Built-in 7.4V 1100mAh rechargeable Li-ion battery, which can be easily recharged by the included USB cable, long working time and convenient usage. Various Installation Methods: equipped with a 1/4 inch screw hole and including a ball head and a cold shoe adapter, you can install the LED light on camera, waterproof housing boot seat, photographic lighting bracket system, tripod, etc. Durable and Sturdy Shell: the shell adopts PC110 synthetic material and aluminum alloy, which has strong resistance to fall and heat; can better protect the built-in lamp beads and prolong the life-span of the LED light. The camera, tripod, waterproof housing and underwater lighting system showed in the picture are not included.